Tremendous advances have been made in joint replacement surgery. In 2008, we invested in a new type of surgical technology to benefit joint replacement surgery even more – the Orthopedic Navigation System. 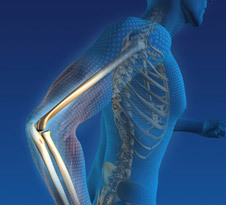 The System provides computer-assisted navigation technology, utilizing special tracking devices that provide orthopedic surgeons with a comprehensive understanding of a patient’s joint mechanics. With this information, a surgeon can make adjustments within degrees, helping to ensure that the new joint has the stability and range of motion needed for a successful replacement. How it works. As the surgeon moves an instrument within your joint, special infrared trackers calculate its position and wireless instruments instantaneously transfer the data to a computer in the operating room. This information is then displayed on a monitor as an interactive model of the anatomy or “blueprint” that also shows the surgeon all angles, lines and measurements of your unique anatomy. The surgeon uses the monitor while replacing the diseased bone with new, artificial joint components, often called prostheses or implants. The virtual model helps a surgeon identify and make necessary adjustments to the implants to help ensure your new joint has the stability and range of motion needed for a successful replacement. United Regional is the only hospital in Wichita and the surrounding eight counties that provides surgeons with this technology.